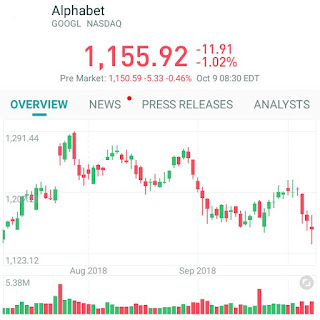 Alphabet Inc. Stock Analysis Technical stock analysis for Mon 08'th Oct 2018 Sell candidate since 2018-10-04 Loss -1.80% Shorts 1.36% ( 2018-09-14 ) Cash 202 014.0 mill Loans n/a Beta 1.04 ROA 8.36 Access today's Top 5 Sell Candidates Alphabet Inc. fell by -1.02% in the last day from $1 167.83 to $1 155.92 and has now fallen 4 days in a row. The price has been going up and down for this period, and there has been a -2% loss for the last 2 weeks. Volume has increased in the last day by 0.71 million shares, but on falling prices. This may be an early warning and the risk will be increased slightly for the next couple of days. In total, 2.30 million shares bought and sold for approximately $2 661.67 million. 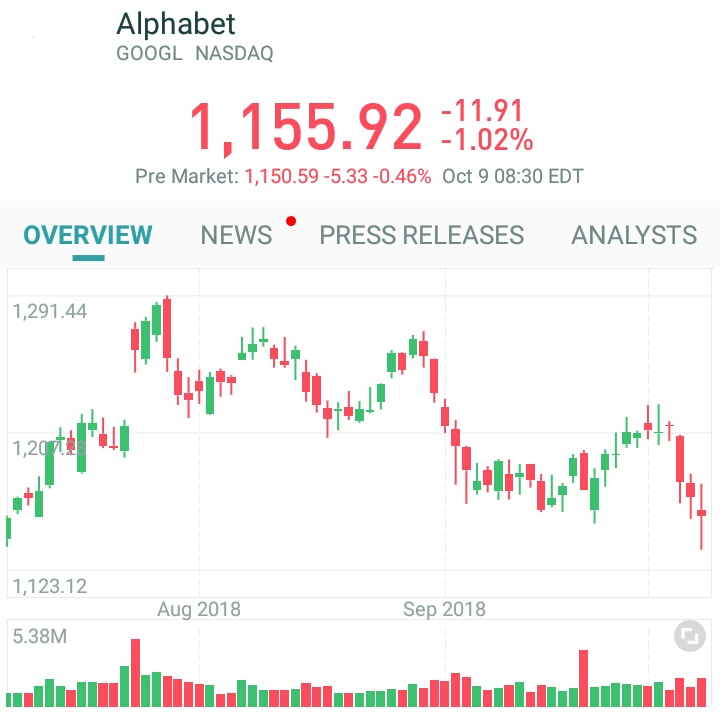 The 41 analysts offering 12-month price forecasts for Alphabet Inc have a median target of 1,405.00, with a high estimate of 1,657.60 and a low estimate of 1,080.00. The median estimate represents a +21.55% increase from the last price of 1,155.92. The current consensus among 44 polled investment analysts is to Buy stock in Alphabet Inc. This rating has held steady since September, when it was unchanged from a Buy rating.